I’ll be honest, as far as this chipset naming scheme goes it feels that we might be starting to run out of sensible candidates. The Englishman in me wants to eschew this platform completely and hold out for the inevitable lake of Tea that is no doubt on the way. But alas the benchmarking has bean done and it’s too latte to skip over it now. *Ahem* sorry, I think it’s almost out of my system now. Time To Wake Up and Smell The…. 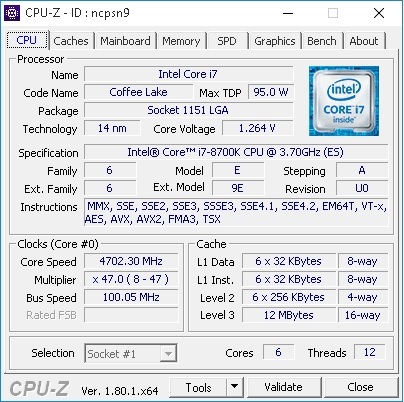 Coffee Lake has been a blip on the horizon for quite a while now, and the promise of more cores in the middle and lower end CPU brackets whilst inevitable has no doubt taken a bit longer than some of us might have expected. Is it a knee-jerk reaction to the AMD’s popular releases earlier this year? I suspect the platform itself isn’t, as it takes a lot more than 6 months to put together a new chipset and CPU range but certainly it feels like this new hardware selection might be hitting the shelf a little earlier than perhaps was originally planned. Currently its clear that we’ve had a few generations now where the CPU’s haven’t really made any major gains other than silicon refinement and our clock speeds haven’t exceeded 5GHz from the Intel factory (of course, the more ambitious overclockers may have had other ideas), the obvious next move for offering more power in the range would be to stack up more cores much like the server-based bredrin in the Xeon range. What is undeniable is that it certainly appears even to the casual observer that the competitor’s recent resurgence has forced Intel’s hand somewhat and very possibly accelerated the release schedule of the models being discussed here. I say this as the introduction of the new range and i7 8700K specifically that we’re looking at today highlights some interesting oddities in the current lineup that could be in danger of making some of the more recent enthusiast chips look a little bit redundant. This platform as a whole isn’t just about an i7 refresh though, rather we’re seeing upgrades to the mainstream i7’s, the i5’s and the i3’s which we’ll get on the bench over the coming weeks. 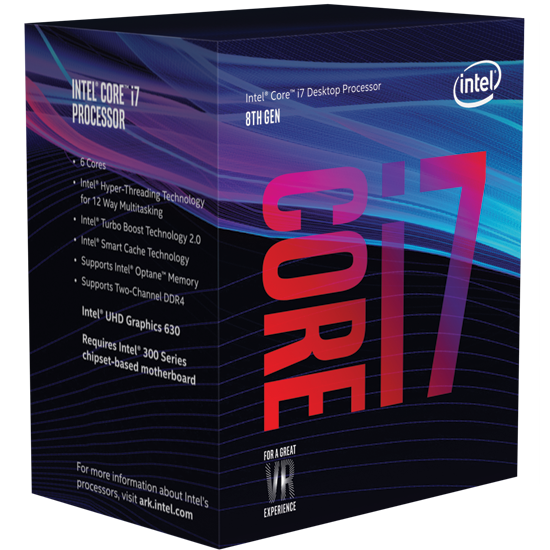 The i7’s have gained 2 additional physical cores and still have the hyperthreading meaning 12 logical cores total. The i5’s have 6 cores and no hyperthreading. 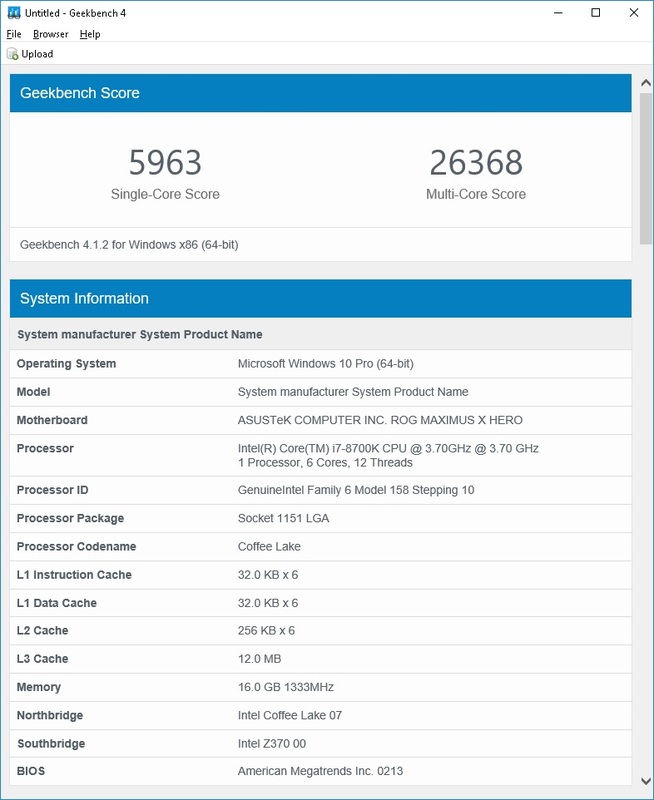 The i3’s have 4 cores and no hyperthreading. Positioning wise Intel’s own suggestions have focused towards the i5’s being pushed for gaming and streaming with up to 4 real physical cores being preferred for games and then a couple extra to handle the OS and streaming. The i3’s keep their traditional entry-level home office and media center sort of positioning that we’ve come to expect over the years and then that gives us the 6 core i7’s sat at the top of the pile of the more mainstream chip options. Intel traditionally has always found itself a little lost when trying to market 6 cores or more. They know how to do it with servers where the software will lap up the parallelization capabilities of such CPUs with ease. But when it comes to the general public just how many regular users have had the need to leverage all those cores or indeed run software that can do it effectively? It’s why in recent years there has been a marked move towards pushing these sorts of chips to content creators and offering the ability to provide the resources that those sort of users tend to benefit from. It’s the audio and video producers, editors, writers and artists that tend to benefit from these sorts of advances. In short, very likely you dear reader. Ok, so let’s take a look at some data. At base clock rates the chip itself is sold as a 6 core with Hyper-threading and runs with a clock speed of 3.7GHz and a max turbo of 4.7GHz. For testing, I’ve locked off all the cores to the turbo max and tested with a Dark Rock 3 after testing various models before starting. With the cooler in hand, it was bouncing around 75 degrees after a few hours torture testing which is great. I did try running it around the 5GHz mark, which was easy to do and perfectly stable, although with the setup I had it was on the tipping point of overheating. If you updated it to a water cooling loop I reckon you’ll have this running fine around the 5GHz and indeed I did for some of the testing period with no real issues, although I did notice that the voltages and heat start to creep up rapidly past the 4.7GHz point. 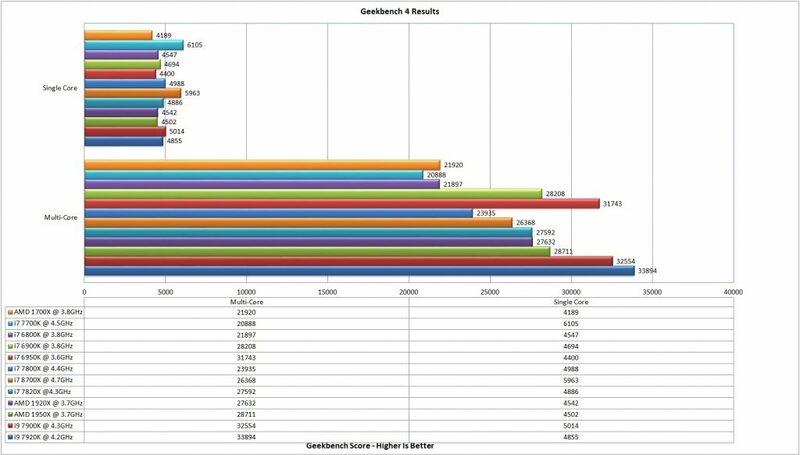 The Geekbench 4 results show us some interesting and even slightly unexpected results. 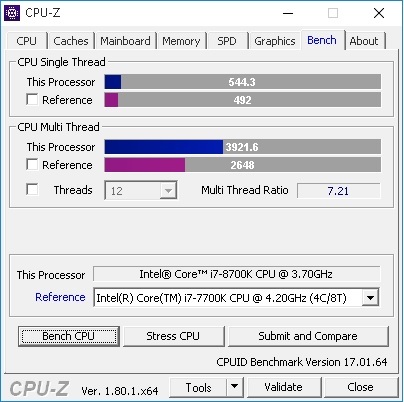 With the previous generation 7700K being clocked to 4.5GHz when I benched it and the 8700K being run at 4.7GHz I was expecting to see gains on the single core score as well as the increase in the multicore score. It’s only a few percent lower and I did retest a couple of times and found that this was repeatable and I had the results confirmed by another colleague. The multicore score, on the other hand, shows the gains that this chip is all about with it not only exceeding the previous generation as you would expect with more cores being available. The gains here, in fact, highlight something I was already thinking about earlier in the year when the enthusiast i7’s got a refresh, in that this chip looks to not only match the 7800X found in the top end range but somewhat exceeding its capabilities at a lower overall price point. 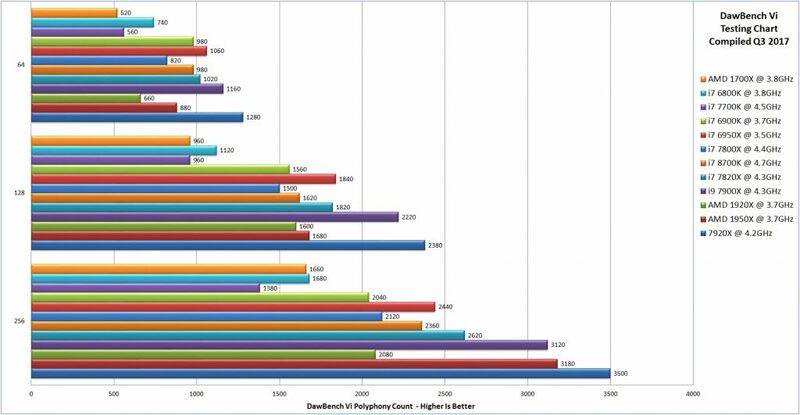 In the testing above both the DAWBench DSP and the DAWBench vi tests continue to reflect this too, effectively raising questions as to the point of that entry-level 7800X in the enthusiast range. The is almost price parity between the 7800X and 8700K at launch although the X299 boards tend to come in around £50 to £100 or more than the boards we’re seeing in the Z370 range. You do of course get extra memory slots in the X299 range, but then you can still mount 64GB on the mid-range board which for a lot of users is likely to be enough for the lifecycle of any new machine. You also get an onboard GPU solution with the 8700K and if anything has been proven over the recent Intel generations, its that those onboard GPU solutions they offer are pretty good in the studio these days, perhaps also offering additional value to any new system build. I’m sure pricing from both sides will be competitive over the coming months as they aim to steal market share from each other. So with that in mind, it’s handy to keep these metrics in mind, along with the current market pricing at your time of purchase in order to make your own informed choice. I will say that at this point Intel has done well to reposition themselves after AMD’s strongest year in a very long time, although really their biggest achievement here looks to have been cannibalizing part of their own range in the process. That, of course, is by no means is a complaint as when pricing is smashed like this then the biggest winner out there is the buying public and that truly is a marvelous thing. 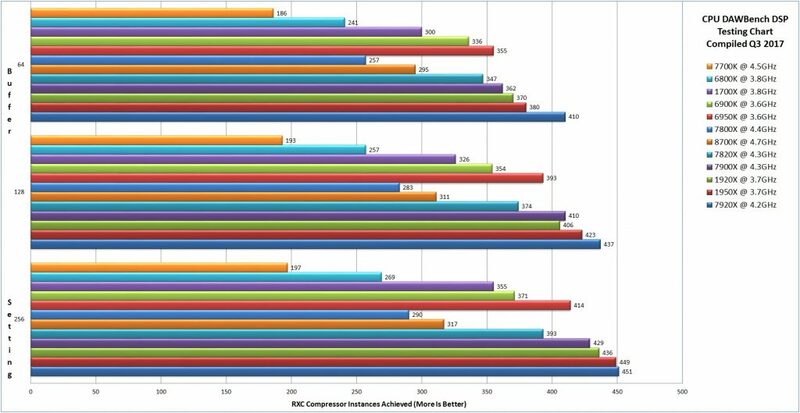 Comparing the 8700K to the 7700K on Geekbench alone shows us a 50% improvement in performance overheads for a tiny bit more than the previous generation cost, which frankly is the sort of generation on generation improvement that we would all like to be seeing every couple of years, rather than the 10% extra every generation we’ve been seeing of late. Whether you choose to go with an Intel or an AMD for your next upgrade, we’ve seen that the performance gains for your money are likely to be pretty great this time around on both platforms. If your current system is more than 3 or 4 years old then it’s even more likely that the will be a pretty strong upgrade path open to you when you do finally choose to take that jump. With hints of Ryzen 2 being on its way next year from AMD and the likelihood that Intel would never leave any new release unchallenged, we could be in for an interesting 2018 too!